Probioskin ® are challenging everyone to make a Green Smoothie with Alkalise Green & Go every morning in a smoothie for 40 days. At the end of the 40 days we will give you another 40 days supply of Alkalise Green & Go completely free of charge. Yes that’s right FREE of charge! Well … nah, there is no catch only benefits. Because we care about you we want to make sure you are receiving the healthy benefits that come from taking Mayella ® Alkalise Green & Go daily! We are not going to just give you any old buy one get one free deal that sits in the cupboard and doesn’t get used! 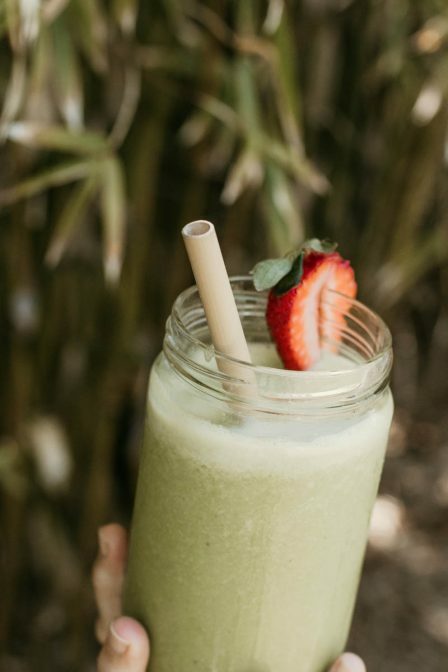 Sorry guys but we want you to have fun, push through and really get into the new habit of enjoying the healthy benefits a Mayella green smoothie or juice will bring you. So we are giving you some incentive and the opportunity to benefit in so many ways. Oh and of course you need to prove to us that you are having your greens daily so to receive your free tub of Alkalise Green & Go you have to follow Our Rules! Below we have a shopping list of suggested ingredients and on our website we have many recipes for you to try as well as regularly posting them on our facebook and instagram. Thank you! We received your message you shall receive your ebook via email soon! Alkalise Green & Go Complete the challenge and get your next tub free! Unsweetened Juices of your choice – eg grapefruit, apple, pear, cranberry, pineapple, watermelon, cucumber, lemon, celery, coconut water, filtered pure water. Milk of your choice – eg soy, rice, cow, oat, macadamia, almond, goat, coconut. Extras – eg almonds, chia seeds, sunflower seeds, rolled oats, ginger, mint, tahini, goji berries, cinnamon, garlic, dates, hemp seeds, buckinis, carob powder, cacao nibs, cacao, almond butter, coconut oil. Sweetener – eg honey, rice malt, dates, agave syrup, coconut nectar. Not really needed as fruits will have plenty of flavour and natural sweetness but if you feel you need to, be conservative with how much you add. As you alkalise more and gently detox, its surprising how your taste buds will change / improve. Of course you will need a good blender and if you want to make you own fresh juices, a juicer. Message us if you have any questions about where to start here. Please note: If experiencing difficulty with bowel movements, dandruff, scalp and skin irritations or allergies, our Probioskin ® Alkalise Green & Go 40 Day Smoothie Challenge over the 40 days will be a blessing to soothe an overloaded and irritated, inflamed system. To increase benefits of our Challenge, variations for juice based smoothies are to add 20ml of an Aloe Vera juice such as Lifestream Aloe Vera juice. Aloe Vera is a beautiful and gentle ant-inflammatory, loaded with micronutrients and very hydrating to our cells, digestive tract, lymphatic system, and can be beneficial to our kidney function, allowing better elimination of acidity. NB:It is always best to choose an Aloe Vera juice without pulp as it is gentler on the digestion and less likely to be a strong laxative. Why should I take the Probioskin ® 40 day challenge? These days most of us are typically undernourished and lacking vital greens. Instead we rely on carbohydrates and sugar for energy and filling up. The irony is that we are eating more of less real foods as it takes more to fill us up, to have our body recognise that it has enough of something to function. Eating so much overloads our digestive system with too much food that is typically difficult to digest. We have to use a lot of our energy in the digestive process only to receive less nutrition than we need to grow, be healthy, live. We’ve made our Probioskin ® Alkalise Green and Go 40 Day Smoothie Challenge a 40 day commitment as we know you will find it easier every day you undertake including a green juice or smoothie into your day. How good you start to feel after a week will make it easy for you to continue. Our skin cells have an average 28 day cycle of birth life and death, for women our menstrual cycle is an average of 28–30 days. Allowing 40 days of being green will give your body the opportunity to rebuild with all the vital nutrients found in Probioskin ® Green Super Foods. Your skin will start to show the benefits of including Green in your day. For some this will mean allergies, pigmentation, rashes or dry skin will lessen or disappear. Depending how long you have had the rash or allergy or the cause, will determine how long it will take to benefit from the nutritional goodness your body is receiving. 1 Like our Probioskin.com page on facebook and follow us on instagram if you have both. Remember you are doing this for you but how amazing is it to inspire your friends and family to do the same! 2 Purchase a 400 g tub of Mayella Organic Alkalise Green & Go from our online shop. 3 Take Mayella Alkalise Green & Go for 40 consecutive days making sure you remember to take photographic evidence! 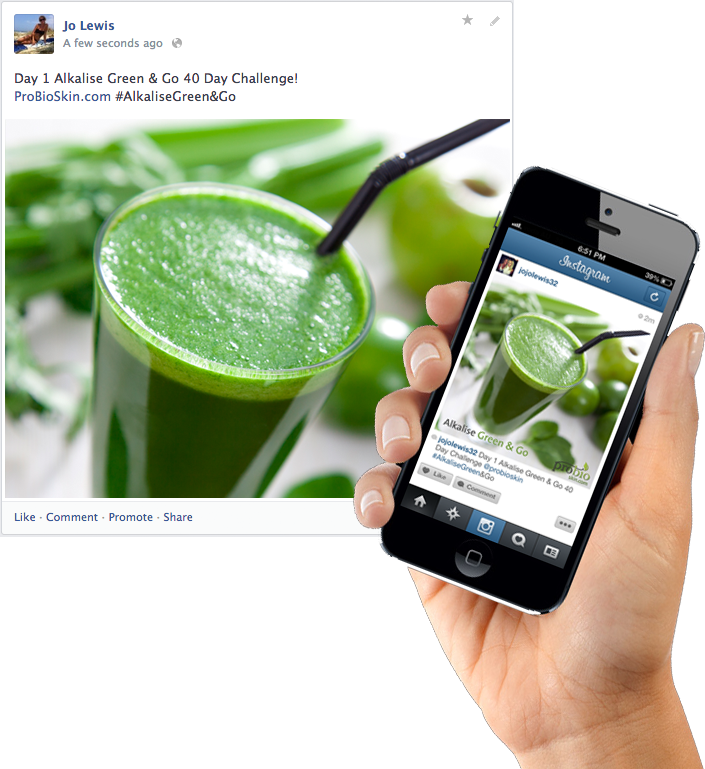 4 Every day for 40 days share your photographic evidence of your green smoothie to facebook and instagram if you have both. 5 Please remember you must tag our instagram and facebook page @probioskin.com and use the hash tag #AlkaliseGreen&Go to qualify. 6 Providing you meet the above requirements you will qualify for a Free tub of Alkalising Green & Go at the end of 40 days. So yo can keep on with the best daily habit you will create for your Self this year! 7 On Day 40 Facebook or Instagram message us and providing you have qualified we will send your Free tub of Mayella ® Alkalising Green & Go – Yay!!! Take the Challenge and discover and experience the feeling of energy and wellness and at the end of the 40 day smoothie challenge reap the rewards! Happy Alkalising People … have fun when you Share the Love … here is an example of how to share your Alkalise Green & Go Photographic evidence to qualify.